Crowe says he came up with the idea for this unique neuro-stimulator over 16 years ago, when he would get into the cold Atlantic ocean so he could observe the effects of shivering. He discovered that as he got colder he didn’t shiver faster, but more and more of him shivered at the same rate (~7-8Hz), until even his teeth were chattering. He also found that this natural way of burning calories was not dependent on generating muscle tension or moving the joints. So a person could burn a lot of calories without actually doing any exercise. Over the years, Crowe did even more research on how to use shivering as an effective training and weight-loss tool, and developed a number of devices that rely on his findings. The BionicGym is the most advanced of them all, and he and electronic wizard Dr. Barry Broderick have teamed up to bring it to market. Only in order to do so, they need some funding to redesign the device, miniaturize some of the components and ultimately make it commercially viable. They estimate that this process will take the two of them about eight months to complete, after which the product has to be approved by regulators before being shipped out. There’s no telling how long that last part will take, but the two inventors estimate that BionicGym will be ready for shipping by November 2017. But people seem so impressed by the capabilities of BionicGym to give them a workout while resting on a sofa, that they seem to have no problem parting with $300 for the chance to one day try it out. Crowe’s Indiegogo crowdfunding campaign had a goal of $20,000, but with 11 day to go, it has already passed the $287,000 mark. 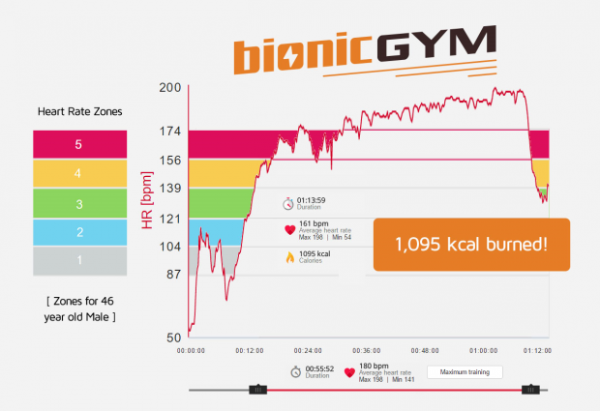 In a promotional video, Crowe presents a graph showing that used at peak levels, BionicGym can burn around 1100 calories per hour, and get your heart rate up to around 180 bpm. Sounds impressive, but the doctor and inventor that using the device at high intensity makes for a very tough workout, requiring previous training. Beginners or older people can use it at lower levels – the equivalent of walking – and make their way up to the tougher programs. 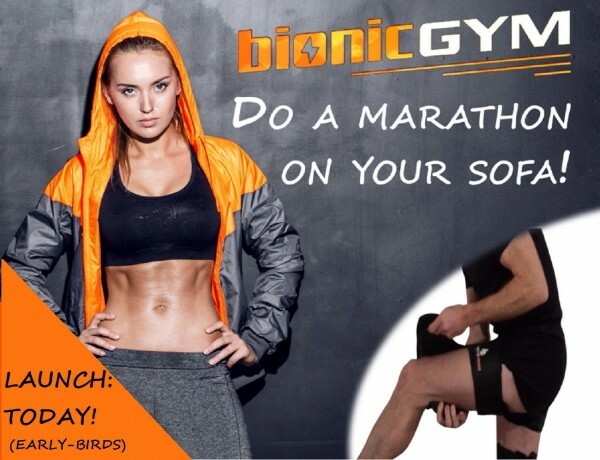 If running a marathon, or doing an intense cardio workout from the comfort of your sofa sounds interesting, you can still pledge $349 for the BionicGym Standard, or $379 for the Pro version. The first is designed for moderate exercise, while the latter is aimed at people “who want to get really fit”.